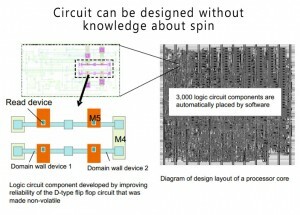 Researchers at NEC Corporation and Tohoku University have developed the worlds first technology for improving the reliability of spintronics logic integrated circuits. The intention is to reduce the standby power of electronic devices to zero. Spintronics logic integrated circuits use two of the properties of electrons, namely negative charge and spin, one of the properties of electrons that makes them behave like tiny magnets. By flipping the polarity of these tiny magnets between “north” and “south” according to the direction of an electric current, it is possible to remember the results of a calculation. 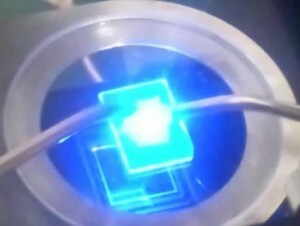 The behavior of this technology has been verified and proven by using a prototype chip. Intel recently installed the largest operating solar power plant in Vietnam at Intel‘s Saigon Hi-Tech Park facility in Ho Chi Minh City. Placed on the roof of the Vietnam Assembly and Test Factory is 1,092 high-efficiency photovoltaic panels, expected to generate about 321,000 kWh per year. The system came online in April and joins a previous installation in Israel as Intel‘s second solar array outside the U.S. Solar sites converting sunlight to electricity are now located at 15 Intel sites within four states in the U.S., Israel and now also Vietnam. 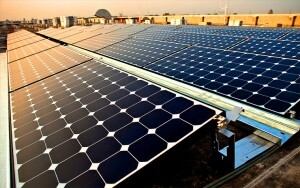 The power of the sun also heats nearly 100 percent of the water used in Intel‘s facilities in Bangalore, India. Intel estimates that the solar installations at it’s facilities generate up to 5.5 million kWh annually, a good thing both for Intel‘s wallet and the environment. Today Hewlett Packard unveiled research from HP Labs on how to build the first Net Zero Energy Data Center. 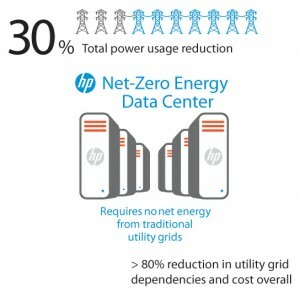 HP Labs architecture significantly reduces the data centers power costs and energy requirements. The end goal is to create an architecture for a data center that requires no net energy from traditional power grids. The research shows how the architecture, combined with holistic energy-management techniques, enables a company or organization to cut total power usage by 30 percent. It also reduces dependence on the power grid, and costs by more than 80 percent. With HP Labs Net-Zero Energy Data Center research, the company wants to provide a solution for businesses and societies around the world, making it possible to run a data center more sustainable and more economic. By using local renewable resources, removing dependencies such as location, energy supply and costs, it opens up the possibility of introducing IT services to organizations of all sizes. 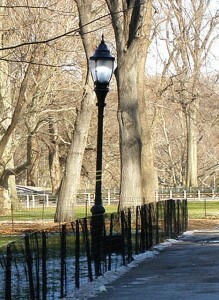 New York City Department of Transportation (DOT) Commissioner Janette Sadik-Khan, recently announced the installation of light-emitting diode (LED) fixtures across New York City. Effected areas include Central Park, the East River Bridges, Eastern Parkway and the under-deck of Manhattan’s FDR Drive. The new LED based lighting installations is intended to provide substantial energy- and cost-savings, while also providing good, and in some cases improved illumination levels to these public spaces. “Energy-efficient LEDs light up our parks, bridges and streets and also bring years of cost savings to our city”, said Commissioner Sadik-Khan. “From recycled asphalt to low-emission fuel on the Staten Island Ferry to energy-saving necklace lights on the Brooklyn Bridge, we are engineering a greener, greater city for generations to come.” The LED program is expected to save nearly $300,000 in annual energy and maintenance costs fiscal year 2013, and additional savings is expected to follow. 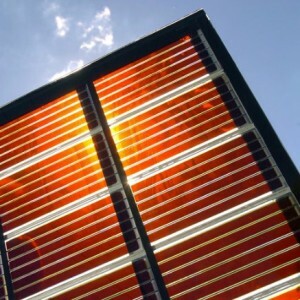 Researchers at Northwestern University have developed a way to make solar cells that are inexpensive, got good operating efficiency, and also lasts longer than traditional dye-sensitized solar cells. Based on Grätzel cells, that use a molecular dye to absorb sunlight and convert it to electricity, it doesn’t rely on toxic or scarce materials during manufacturing making it very environmentally friendly. The problem with Grätzel cells is that they typically don’t last more than 18 months. Grätzel cells use dye-sensitized cell’s electrolyte, made of an organic liquid and intended to mimic how chlorophyll work in plants. This organic liquid can leak and corrode the solar cell itself, making it’s life expectancy very short. Researchers have been searching for an alternative for two decades, and a team at Northwestern University have now found a possible solution using a liquid, that after applied ends up as a solid, preventing leaks and greatly improving the life of the solar cells. In Manila, Philippines the Boni Tunnel in Mandaluyong is now brighter and more energy efficient thanks to a new innovative solar powered LED lighting system from Philips. Not only is great for the environment, but the city government of Mandaluyong also expects to save up to P240,000, approximately $550,000, every year in electrical costs. The lighting system is expexted to save up to 51% in electricity expenses every year, and consists of Philips tubular LED lighting systems that will be solar-powered by day, and powered by the power grid at night. 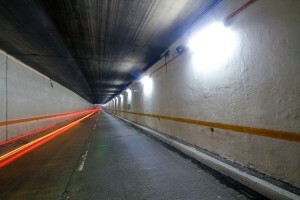 The tunnel lighting system is connected via a grid-interactive photovoltaic system with solar panels placed on top of the tunnel. The solar panels are connected to power converters, and then hooked up to the Meralco power grid. NGK Insulators, Ltd. has announced it has developed gallium nitride (GaN) wafers that can double the luminous efficiency of a LED light source compared to conventional materials. With the assistance of a research institute outside the company, tests were performed to measure the luminous efficiency of an LED element using NGK’s new GaN wafer. With an injection current of 200mA, the GaN wafer during the tests showed an internal quantum efficiency of 90%. The GaN wafer achieved a luminous efficiency of 200lm/W, which is twice as efficient as those on the market today. This in affect means that with this new solution the power consumption can be reduced by up to 50%, while upholding the same brightness of a traditional LED. 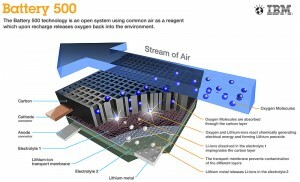 IBM adds new partners to lithium-air battery 500 project. Today IBM announced that two industry leaders, Asahi Kasei and Central Glass, will join and collaborate on their Battery 500 Project. Back in 2009, IBM Research pioneered a sustainable mobility project to develop lithium-air battery technology, capable of powering a family-sized electric car for approximately 500 miles (800 km) on a single charge. With these new partners there is a great potential to accelerate the switch from gasoline to electricity as the primary power source for vehicles. A new concept has since October been tested in the Abu Dhabi desert, that uses a wind turbine to condense water from the air. After the water has been collected, it’s then pumped in into storage tanks for filtration and purification to deliver fresh drinking water that is up to WHO standards. With it’s innovative technology, Eole Water can create water in almost any place on earth by using the power of wind energy, and the natural humidity in the air around us. Earth atmosphere is filled with humidity at an estimated capacity of 13000km3 natural water. 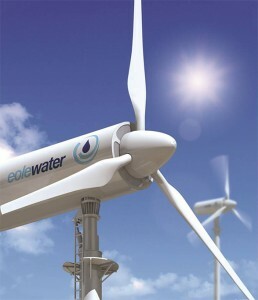 By using wind power Eole Water is able to liquefy the air steam, and humidity is sucked up and then condensate. 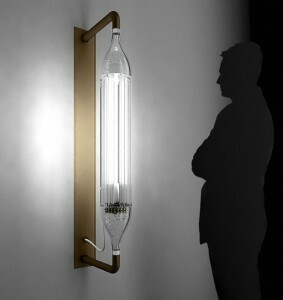 A new lighting concept intended for domestic application, use an untapped (no pun intended) energy reserve located in every modern home. Applying basic hydroelectricity principles the system creates energy with the help of micro turbines placed in already existing plumbing. The turbines will move every time water gushes through the pipes and harvest energy that otherwise literary just goes down the drain. This system uses a low cost method of generating renewable energy, and shows that there is still a lot of things we can do to stop the energy waste in our every day lives. Well known principles and existing systems can often be used, adapted and applied in a different way. And even though some ideas might seem simple at first, the results can be pure genius.